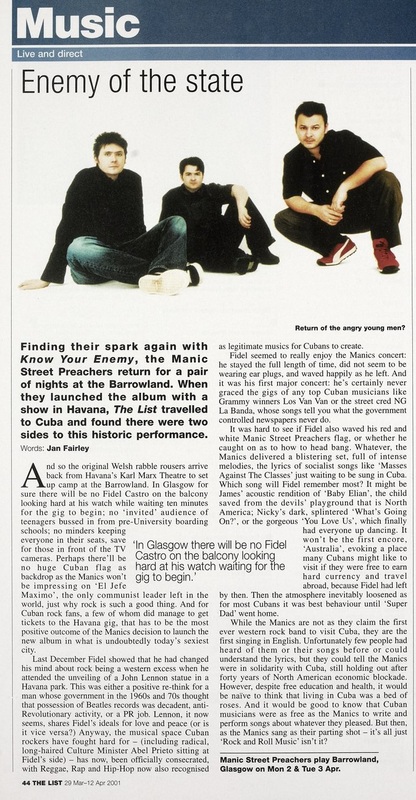 Finding their spark again with Know Your Enemy, the Manic Street Preachers return for a pair of nights at the Barrowland. When they launched the album with a show in Havana, The List travelled to Cuba and found there were two sides to this historic performance. And so the original Welsh rabble rousers arrive back from Havana's Karl Marx Theatre to set up camp at the Barrowland. In Glasgow for sure there will be no Fidel Castro on the balcony looking hard at his watch while waiting ten minutes for the gig to begin; no 'invited' audience of teenagers bussed in from pre-University boarding schools; no minders keeping everyone in their seats, save for those in front Of the TV cameras, Perhaps there'll be no huge Cuban flag as backdrop as the Manics won't be impressing on 'El Jefe Maximo', the only communist leader left in the world, just why rock is such a good thing. And for Cuban rock fans, a few of whom did manage to get tickets to the Havana gig, that has to be the most positive outcome of the Manics decision to launch the new album in what is undoubtedly today's sexiest city. Last December Fidel showed that he had changed his mind about rock being a western excess when he attended the unveiling of a John Lennon statue in a Havana park. This was either a positive re-think for a man whose government in the 1960s and 70s thought that possession of Beatles records was decadent, anti-Revolutionary activity, or a PR job. Lennon, it now seems, shares Fidel's ideals for love and peace (or is it vice versa?) Anyway, the musical space Cuban rockers have fought hard for - (including radical, long-haired Culture Minister Abel Prieto sitting at Fidel's side) - has now, been officially consecrated, with Reggae, Rap and Hip-Hop now also recognised as legitimate musics for Cubans to create. Fidel seemed to really enjoy the Manics concert: he stayed the full length of time, did not seem to be wearing ear plugs, and waved happily as he left. And it was his first major concert: he's certainly never graced the gigs of any top Cuban musicians like Grammy winners Los Van Van or the street cred NG La Banda, whose songs tell you what the government controlled newspapers never do. It was hard to see if Fidel also waved his red and white Manic Street Preachers flag, or whether he caught on as to how to head bang. Whatever, the Manics delivered a blistering set, full of intense melodies, the lyrics of socialist songs like 'Masses Against The Classes' just waiting to be sung in Cuba. Which song Will Fidel remember most? It might be James' acoustic rendition of 'Baby Elian', the child saved from the devils' playground that is North America; Nicky's dark, splintered 'What's Going On? ', or the gorgeous 'You Love Us', which finally had everyone up dancing. It won't be the first encore, 'Australia', evoking a place many Cubans might like to visit if they were free to earn hard currency and travel abroad, because Fidel had left by then. Then the atmosphere inevitably loosened as for most Cubans it was best behaviour until 'Super Dad' went home. While the Manics are not as they claim the first ever western rock band to visit Cuba, they are the first singing in English. Unfortunately few people had heard of them or their songs before or could understand the lyrics, but they could tell the Manics were in solidarity with Cuba, still holding out after forty years of North American economic blockade. However, despite free education and health, it would be naive to think that living in Cuba was a bed of roses. And it would be good to know that Cuban musicians were as free as the Manics to write and perform songs about whatever they pleased. But then, as the Manics sang as their parting shot - it's all just 'Rock and Roll Music' isn't it? This page was last modified on 29 March 2018, at 18:45.